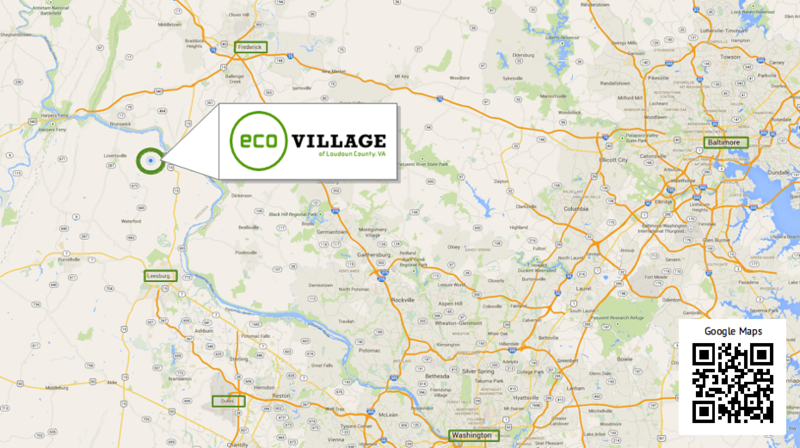 EcoVillage is located just a few miles north of Leesburg, VA in beautiful Loudoun County. The Maryland commuter rail (MARC) has a station in Point of Rocks, MD which is 5 minutes away. This train will bring you to Rockville, MD in about 30 minutes and to Union Station in Washington, DC in about an hour. The closest airport is Washington-Dulles (IAD), which is about 40 minutes away from EcoVillage. The other two airports in the area (National/DCA and Baltimore-Washington/BWI) are about 70 minutes away. Metro‘s closest stations are in Shady Grove (red line in MD – 35 minutes away by car), and Reston, VA (silver line – 30 minutes away by car). Both lines will bring you directly to the major spots in the Metro system, such as Rockville/Bethesda, Tysons Corner, or Washington, DC. If you plan your trip to EcoVillage by car, please have a look at Google Maps.